[2014-2017] Ready for the next big thing from Klondike? 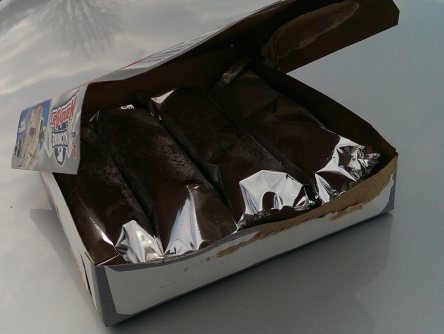 Now technically we saw skinny cow have some frozen candy bar fun last year, but now it's time for Unilever to respond with their own version, and since it's Klondike, you know it's going to be a trifecta of crazy. And then it hit me: dark chocolate! 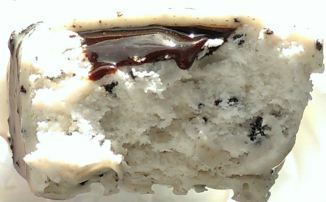 Check out the description for the cookies & cream version: vanilla light ice cream with dark chocolate crunch pieces topped with chocolate fudge in a white chocolate. I can't resist, this one is all mine! The flavor of the fudge stripe is trying to dominate everything here. It's not a terrible flavor, but I would prefer something thicker and more balanced... or better yet, just leave it out all together. There is a bit of like a Hershey's Cookies & Cream bar flavor to the shell, but it's not nearly as strong as I wanted. A nice, thick, CnC bar kind of has that nice white chocolate softness to it that coats your tastebuds and leaves a nice aftertaste. This shell is thin, cracking everywhere, and way too mild. It would probably help if the ice cream wasn't so soft and unable to take the pressure of my munching. Disappointed, I shove in the last 25% of the bar which turns out to be a huge mistake. That shell that wouldn't stay together? Yeah, well, it just broke apart and twisted in such a way as to poke me in the back of my throat. Granted, I shouldn't have taken such a huge bite, but I still say that shouldn't have happened. Ugg, I got it good too (it took awhile for the poking to fade from memory). Ahhh, we'll see how the second scooping goes tomorrow, but at the moment, this is a bust for me. On Second Scoop: There's just something missing here. It doesn't remind me of a CnC candy bar, or a CnC ice cream, or even an Oreo vibe. The so-so fudge aftertaste doesn't help. 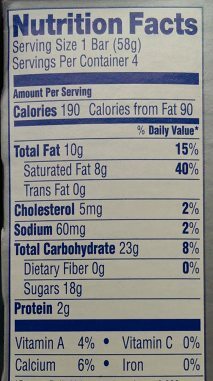 This was is just blah for me and I'll eat the last two bars only because I hate to waste. This looks really cool and delicious, so I am disappointed that it failed to deliver. I have to give credit to the makers for trying something this unique though. I just had an oreo one, I thought it was good. Expectations are always going to be unrealistic with a delicious product like Klondike because I also expected better for that reason only. If it was called "Moe's Tasty Creams" I'm sure the author's review would read differently. @Stride: indeed, idea good, but feels more like idea then realistic product. @Anon: I'm glad you enjoyed it. 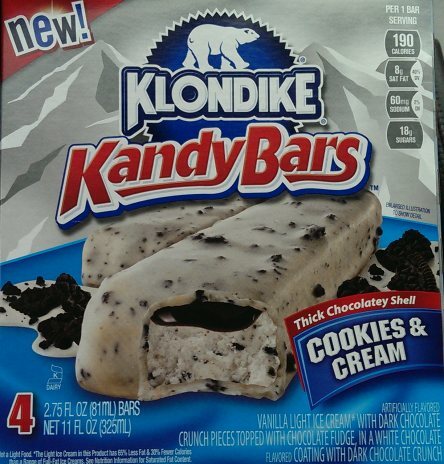 To be honest, my expectations were tempered by the fact that Klondike's new product track record is so-so at best. I'm hoping the simpler flavors will be easier to execute and deliver more of what I envision. With any luck, I'll review another one this week.